The Gilded Age, a term coined by Mark Twain, which historians bookend with the end of the Civil War and the start of the twentieth century, is remembered by most for the extravagent frauds perpetuated by the corrupt pol Boss Tweed and Robber Baron Jay Gould. 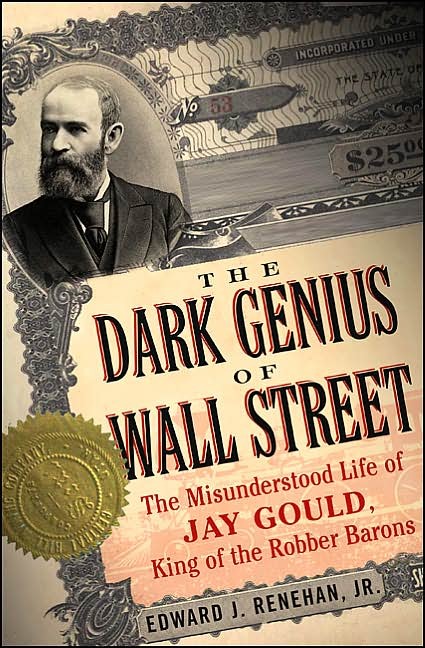 In Dark Genius of Wall Street: The Misunderstood Life of Jay Gould, King of the Robber Barons, Edward J. Renehan, Jr. argues that Gould was not simply misunderstood, but in fact was unfairly maligned by the press of his age. 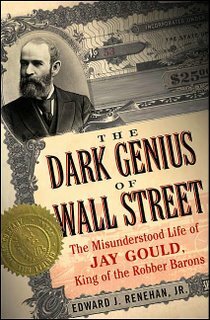 Dark Genius is a brilliantly executed revisionist history of the Gilded Age's most infamous Wall Street operator. Renehan's argument for Gould's rehabilitation is two-fold: First, the reporters of the time got it wrong and historians ever since have followed their lead, and second, Gould did exactly what every other Gilded Age industrialist was doing, he just did it more creatively. Renehan demonstrates over and over how the newspapers, acting more like tabloids, ignored facts, changed dates, and railed against Gould's semetic looks. Particularly after the Erie wars against Vanderbilt and Gould's the attempt to corner the gold market, Gould could do nothing right. Even though Gould actually lost money in the gold market scheme, he was seen as the villianous speculator who had utilized insider information to damage the other players in the market. Gould, in fact, encouraged the bad publicity saying to a friend "that it was better to be feared than to be loved, and explaining that his image as an evil but brilliant wunderkind was his most powerful possession." For this reason, Gould hid his own charitable donations, which only in Dark Genius does he receive any credit for that generosity. Ultimately, Gould assembled a massive empire that rested on the Union Pacific Railroad (and other western lines), Western Union, and the New York Elevated. The newspapers refused to acknowledge Gould as anything more than a speculator, even when his empire proved to be the some of the healthiest pieces of the American economy. 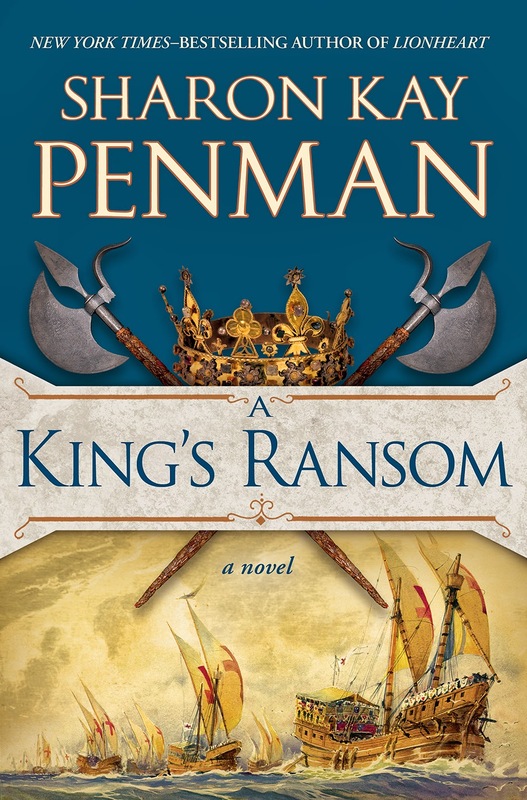 History rememers Gould incorrectly sa well, as Alexander D. Noyes demonstrated writing in 1909, "Few propertieson which this man laid his hand escaped ruin in the end...He was not a builder, he was a destroyer." When Gould died in 1892, his net worth was estimated to be about $125 million, which pales in comparison to Andrew Carnegies $400 million or John D. Rochefeller's $1.4 billion. Yet, Jay Gould is the evil genius according to history. Yes, he bribed assemblymen in Albany, and he used the judicial system to his advantage, but who didn't. The question for history is: Was the US economy better off for all Gould's maneuvering, or not?